One may debate whether the tremors of a systemic crisis in investment arbitration are real, and, if so, of a great enough magnitude to shake its foundations, but it is no longer possible to deny that the current system is coming under intensive scrutiny. International lawyers, who recognize the indispensability of a well-functioning system for settling investment disputes, should be concerned about enhancing the legitimacy and functionality of investment arbitration. A well-calibrated response to the challenges facing investment arbitration is essential to ensuring its long-term future. Critics must be answered; enquiries made; reassessments undertaken. If crucial questions continue to be ignored, or simply glossed over, the strength of, and consequences flowing from, the backlash are likely to be greater in scale. Premised on the belief that an investment arbitration regime which is in listening mode and ready to adapt may draw tremendous strength from constructive criticism, the questions considered by the contributors, and relating to the sustainability and future direction of investment arbitration, demand serious attention from all stakeholders. The reforms and refinements suggested promise to bring substantial improvements to the present regime and, in so doing, could reverse the current trend towards a backlash. All stakeholders in investment arbitration will welcome and learn from this work. 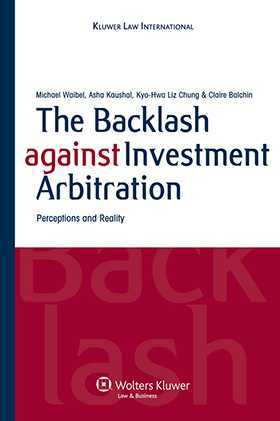 Foreword to the Backlash against Investment Arbitration. The Backlash against Investment Arbitration: Perceptions and Reality; D. Vagts. PART I: THE PROTECTION OF INTERNATIONAL INVESTMENT: ASSESSING TREATY OBLIGATIONS. Chapter 1. Disregarding the Corporate Veil and Denial of Benefits Clauses: Testing Treaty Language and the Concept of “ Investor”; R. Thorn, J. Doucleff. Chapter 2. Private Enforcement of International Investment Law: Why We Need Investor Standing in BIT Dispute Settlement; S. Schill. Chapter 3. Drawing the Limits of Free Transfer Provisions; A. Turyn, F. Perez Aznar. Chapter 5. A Comparison of ICSID and UNCITRAL Arbitration. Areas of Divergence and Concern; S. Jagusch, J. Sullivan. PART II: PARALLEL PROCEEDINGS AND CONFLICTING AWARDS. Chapter 5. The Issues Raised by Parallel Proceedings and Possible Solutions; A. Reinisch. Chapter 6. Parallel Proceedings: A Practitioner’s Perspective; R. Kreindler. Chapter 7. Annulment and its Role in the Context of Conflicting Awards; C. Knahr. Chapter 8. Compensation for Non-expropriatory Investment Treaty Breaches in the Argentine Gas Sector Cases: Issues and Implications; K. Khamsi. PART III: PROTECTING THE PUBLIC INTEREST. Chapter 9. Arbitrator Integrity; W. Park. Chapter 10. Amicus Curiae: A Panacea for Legitimacy in Investment Arbitration? ; N. Blackaby, C. Richards. Chapter 11. Participation of Non-governmental Organizations in Investment Arbitration as Amici Curiae; A. Kawahru. Chapter 12. Legality of Investments under ICSID Jurisprudence; G. Bottini. Chapter 13. Invoking State Defenses in Investment Treaty Arbitration; A. Martinez. PART IV: INVESTMENT ARBITRATION AND ITS DISCONTENTS. Chapter 14.Backlash to Investment Arbitration: Three Causes; L. Wells. Chapter 15. Denunciation of the ICSID Convention and Consent to Arbitration; B. Simmons, A.T. Guzman, Z. Elkins. Chapter 17. The Argentine Financial Crisis: State Liability under BITs and the Legitimacy of the ICSID System; W. Burke-White. Chapter 18. Perceived Bias in Investment Treaty Arbitration? G. Van Harten. Chapter 19. European Law Challenges to Investment Arbitration; M. Burgstaller. Chapter 20. Out of Order; L.E. Peterson. PART V: ICSID ARBITRATION’S FALL FROM GRACE: THE WAY FORWARD. Chapter 21. Globalization: The Driving Force in International Investment Law; T.R. Braun. Chapter 22. A Dispute Systems Design Diagnosis of ICSID; I.M. Penusliski. Chapter 23. The International Investment Protection Regime through the Lens of Economic Theory; A. van Aaken . Chapter 24. ‘History Ain’t Changed’: Why Investor-State Arbitration Will Survive the ‘New Revolution’; T. Nelson. Chapter 25. The State, a Perpetual Respondent in Investment Arbitration? Some Unorthodox Considerations; M. Toral, T. Schultz.